Learn how we’re ensuring fun, fair, and highly competitive matches. Here at Redwood Studios, we’re Rivals players too. That’s why before we add ways to buy premium currency, we want to talk to you about our thinking on the role of power in Rivals and the suite of features we’re preemptively adding to the game to address the concerns of Pre-Alpha players. If you’re thinking it, as players, we are, too. The first and most consequential feature of Rivals Fairplay is unit level capping for all matches. 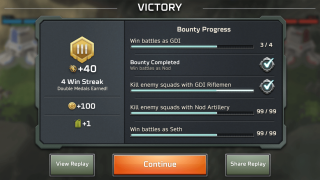 We’ll soon divide all players into distinct ranks based on their Medals count (Bronze, Silver, Gold, etc. ), and within each of those ranks there will be a unit level cap. While you can have units above the cap, when you play a match, those units will be temporarily down-leveled to the cap. 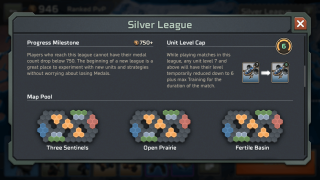 For example, let’s say you’re in Bronze tier where the unit level cap is 6. All your units are level 5 and level 6, so you’re good to go. However, your opponent has a Titan that’s been pumped up to level 12 already. When the match starts, that Titan will be brought down to level 6, which is the highest level allowed. As you climb through the ranks, the level cap will slowly increase, allowing for healthy unit progression but always preventing runaway power. This, more than anything else, ensures that superior skill and tactics are the ways to win matches. The actual unit level cap for each rank is still being tuned and finalized. We’ll release more detailed info in the coming months. Sometimes a player is just too good. We want to accelerate players to the Medals count and rank where they really belong because otherwise you might run into them — and getting crushed feels neither fair nor fun. 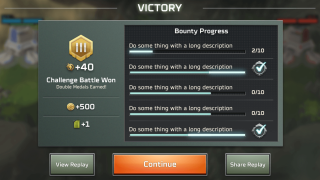 Soon, when you hit your third consecutive win, you’ll automatically receive 2x the normal Medals for that match and will continue to receive double Medals until you lose. Being on a win streak feels great because you’re making tons of progress, and it means we can get you to the rank where you belong faster, allowing us to make better, more competitive matches. Once you reach a new rank (moving from Silver to Gold, for example), you cannot lose your way back to the prior rank. You’re safe and free to experiment with new units, new strategies — whatever your heart desires. There’s no going backward, so have fun with it. We’re doing this because we recognize it’s very challenging to advance to that next big milestone, and we want you to play with confidence knowing if you can get there, you can celebrate the achievement without fearing further play. When it comes to real-time PvP games, the Matchmaker doesn’t have many friends. Usually, if a player is talking about the Matchmaker, it’s because they felt the circumstances surrounding the match put them at an unfair disadvantage. Sometimes, this is a misperception or misunderstanding of how the matchmaking algorithms work. But sometimes, the player is right. And when you’re right, you shouldn’t be punished for playing. Any match made that falls outside our parameters of “fair” will be declared a Challenge Battle. You’ll boldly see this on the loading screen prior to match start. If we make an “unfair” match putting you at a disadvantage, you will not lose Medals if you lose the match and will gain double Medals if you win! If your opponent’s units are close to the level cap and yours are not (enough to make the match feel lopsided), it may be declared a Challenge Battle even if all the units are within acceptable boundaries. 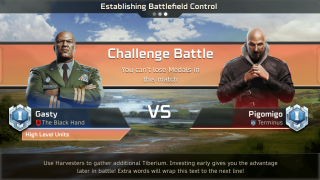 If your opponent has significantly more Medals than you, it may be declared a Challenge Battle. There’s nothing you have to do to trigger a Challenge Battle. It will happen automatically to protect you if either or both “unfair” criteria are met. This way, when the Matchmaker screws up, instead of it being a worst-case scenario, it’s a freebie for you where the only direction you can go is up. 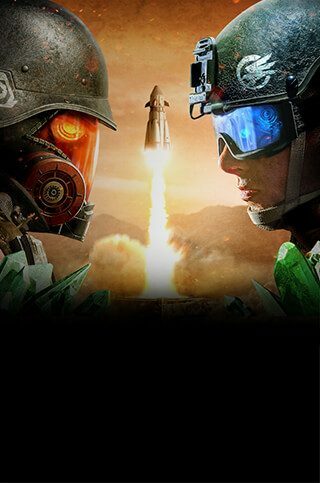 Right now, Command & Conquer: Rivals is on a march to worldwide launch. There’s a lot in the works that’s not in the game yet, these Rivals Fairplay features being among them. It’s quite likely that we’ll be adding ways to purchase premium currency before Rivals Fairplay comes online so we can test the store as early and thoroughly as possible. Rest assured that we fully intend to release Rivals Fairplay during the Early Access Pre-Alpha and before worldwide launch. So, when we open the floodgates and this game becomes available around the globe, everything we’ve talked about above should be in place to safeguard your play experience. As Rivals developers, our commitment to you is fair, fun, highly competitive matches, and we’ll continue to use this Early Access Pre-Alpha and upcoming Soft Launch to tweak and tune until we get it right. Not already in the Early Access Pre-Alpha? Pre-register now for a chance to play before worldwide launch. We want to hear from you. Give us your feedback on Discord and Reddit.